It’s hard to forget the early 90s Canon television commercials featuring a mullet­-haired Andre Agassi repeating the slogan, “Image is everything.” While we at Inflexion (formerly EPIC) may not agree that it’s “everything,” perceptions do play an important role in the effectiveness of schools. Schools that fail to communicate a clear and consistent message risk being “shouted down” by inaccuracies and conflicting messaging. 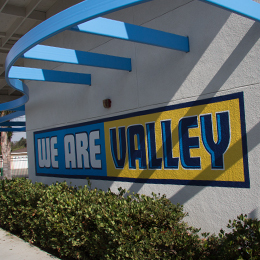 Over the past year, the leadership, students, and community at Valley High School in Santa Ana, California, worked with us to clarify their vision and to create strategies to make them even more effective at moving their students toward success. Valley has amazing people doing incredible work, but through a series of interviews, listening sessions, surveys, and tours in and around the campus, we were able to gather a fairly clear picture of identity challenges that need to be addressed. Challenges such as: poor self perception and lack of school pride, community misconceptions and biases, lack of energizing visuals, branding inconsistencies, and lack of strategic messaging to the feeder schools. Together, we were able to develop and launch an awareness campaign to take on these challenges. We determined that in order to redefine the culture and perceptions, we would need to clarify the message by creating values statements, rework the branding, change the look and feel of the campus, and communicate the message through a wide variety of methods to affect the school’s primary stakeholders. The leadership team at Valley made it clear that they wanted to start things off with a bang. To do this, we fine­-tuned the logo with defined school colors, finalized the values statements, and got to work installing new visuals around the campus. Their goal was that by the beginning of the school year, the campus would be transformed enough that it would be obvious that things are changing, encouraging a sense of anticipation and school spirit. To ensure that people feel welcomed and energized the moment they enter the school grounds, phase one included repainting some of the trim in school colors and placing strategic vinyl graphics on the walls. Custodial staff went right to work repainting trim, enlivening entryways, and adding accent color to the white-on-white hallways. Vinyl sign installers battled unusual humidity and some challenging stucco texture, but were able to get the job done before the students arrived. The early reviews have all been positive. Below are some before and after shots. What do you think? Sure, image isn’t everything, but what people see, hear, and feel as they walk through a campus is evidence of its cultural identity. Developing and enacting a clear, purposeful, and shared identity among the entire school community is the foundation of realizing and assessing progress toward a strategic direction. The Awareness Campaign is just one aspect of the strategic changes being implemented at Valley. Although the campaign has been officially launched, there is a lot more to accomplish in order to redefine and refresh the school’s cultural identity. The next phase will include more painting, poster designs, logo gear (for the students, staff, community, and feeder schools), workshops, branding training sessions, direct mail pieces, social media, pride-building events, and feeder school visitations and events.